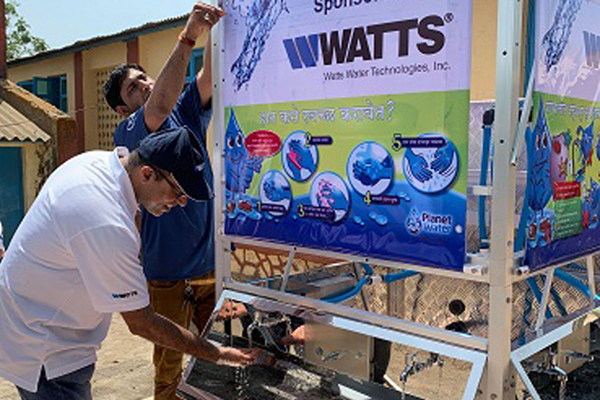 Watts Water Technologies, a leading global manufacturer of plumbing, heating, and water quality products and solutions, recently funded and helped install two water filtration systems that provide clean drinking water for children and families in need in India. Through its partnership with Planet Water Foundation, a US-based non-profit organisation that works to bring clean water to the world’s most impoverished communities, four Watts employees built “AquaTowers” at two schools inside the Thane-Palghar District. Watts employees from its Shanghai (China), Dubai (United Arab Emirates), and Auckland (New Zealand) offices helped erect the towers, which remove harmful particles, bacteria and viruses, providing 1,000 people with 10,000 litres of clean water per unit daily. The effort was part of Planet Water’s “Project 24,” where its corporate partners annually build towers in rural communities on World Water Day (March 22). Watts first joined forces with Planet Water in 2016. Since that time, the organisations have brought clean water to 13,000 people in Cambodia, China, Colombia, India, Indonesia, the Philippines, and Puerto Rico.